When you schedule a posts on Pilot Poster, in some rare cases, the scheduled posts might hit a hard rock on the way due to some reasons, and among the common reasons for a scheduled post to stop running is the ‘Invalid Access Token‘ error. Pilot Poster comes with a Logging feature that stores all of the errors encountered during a scheduled post. And to locate the error log, you need to Navigate to Posts > Scheduled Posts > And Click the Folder Icon at the right-hand side of the displayed table. The invalid access token error simply means the token for the selected app used for posting is expired and needs to be re-authenticated. And to fix, all you need to do is Re-authenticate the current app used for posting. To Re-authenticate, Goto Settings > Facebook Apps > Deauthenticate the App. And then click the Authenticate button again. When you click the Authenticate button again, you do NOT need to go through all of the procedures as you would when Authenticating for the first time. Rather, all you need to click is the Get App Authenticate Link (As shown in the image below). Copy the displayed access token from the next window that displays and then paste in the Access Token Box. 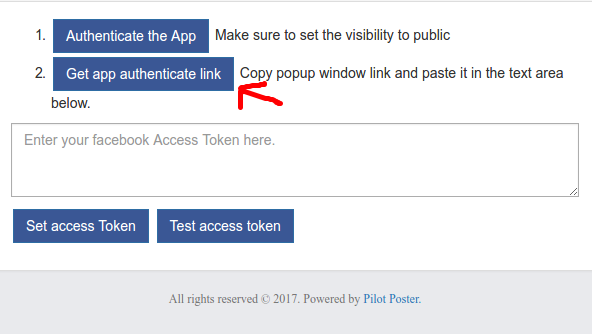 Click the Test Access Token to ensure the copied token is valid, then click the Set Access Token Button. You have successfully re-authenticate your app. Now is time for you to resume the paused schedule or schedule a new post using your authenticated app. I’ve been using pilot poster since last month, it has been awesome since then. the only problem i’m getting lately is that, some of my fb account has been blocked for the reason facebook saying that i’m giving credential password to third party website and it is against their policy. So to avoid my existing account from getting banned , i registered several new account. But then, as i’m adding them, one by one has been detected as suspicious by facebook thus banned. My qusetion is, it is still possible for me as for NOW to add new facebook account and link them to PILOT POSTER? Is there any other way to bypass their strict security i.e clearing cookies or something like that? New Facebook accounts should be verified with a mobile number before posting with them. And we advise you post to just a few groups with long intervals with new accounts. Concerning your old accounts that Facebook complains about credentials, we recommend you authenticate and use HTC Sense for them. thanks for your answers, really appreciate them and i hope it should helps. 1st, i already had an account added to pilot poster. While i was trying to authenticate htc, facebook detected it as unusual action and suddenly made a temporary ban on that account of mine. 2nd thing is, i tried to add new account added to pilot poster. Also it triggered facebook alarm, thus temporaryly banned me for about two days. any suggestion then regarding these problem? oh ok thanks. Somehow i managed to authenticate the htc. mi viene fuori questo errore: “ERRORE [#3]…” A COSA PUò CORRISPONDERE? Ciao, dove ricevi questo errore e puoi inviare uno screenshot? What does this mean? Please help! im getting this Error validating access token: session has expired on saturday, 01-jul-17 22:00:00 pdt. the current time is sunday, 02-jul-17 00:06:04 pdt. I don’t have a PC to use Mozilla Firefox to authenticate HTC sense, can I use Firefox for android and authenticate? Hello, ensure there is no SPACE in between the image you’re posting. I am receiving this error message “Error validating access token: session does not match current stored session. this may be because the user changed the password since the time the session was created or facebook has changed the session for security reasons.” I have re-authenticated my FB profile and HTC Sense. HTC Sense is my default app. What do I need to do to correct this error? I tried re-authenticate Graph API, set as default and try to post, but I recieved the same error. 7. Repeat steps 1-5 for HTC Sense, and then set as your default app. I have tried this and I am still getting the same error. I have reauthenicated my facebook profile, deleted all apps and reauthenicated them. Still getting this error. Hello, have you tried using HTC Sense App? I can’t get the HTC Sense to authenticate. I have tried it through Chrome and FireFox. I also can’t get SpotFly to authenticate. Will this be a daily/hourly thing I will have to do? You cannot authenticate HTC Sense with Chrome for now. Let us know if you face any challenge. can you help me, when I run my post after an an hour or two it will stop even I update the access token. it will run then stop again. what can I do?